within the wall, using the SCREWS (4) supplied. ANCHORS and SCREWS should be used. read instructions carefully before you begin. WATER. DRY WITH A SOFT COTTON FLANNEL CLOTH. Secure MOUNTING PLATES (1) to wall with SCREWS (2). drill two 1/4" diameter holes a minimum of 1-1/4" deep. Insert the two TILE ANCHORS (4) flush with face of the finished wall. small pilot holes for SCREWS (2). illustration below. 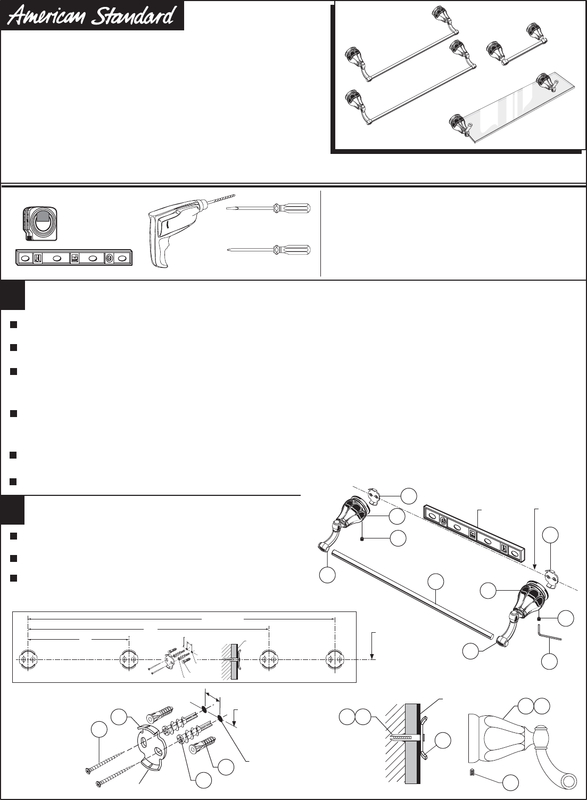 Secure MOUNTING BRACKETS (1) to wall with SCREWS (2). with SET SCREW (6) using 2.5 mm HEX WRENCH (7) supplied. Insert each end of TOWEL BAR (8) into the CRANKS (9). secure with SET SCREW (6) using 2.5 mm HEX WRENCH (7) supplied. American Standard is a great supplier that produce different goods like automotive. Our team collected 366 actual pdf user guides of this supplier . Now you're reading a user guide for American Standard Bathroom Aids 0.18.